WASHINGTON—The Epoch Times was one of dozens of America’s top media organizations honored at the National Press Club for outstanding journalism on June 21. The Sigma Delta Chi Awards are a group of annual honors bestowed by the Society of Professional Journalists for outstanding work in print and broadcast journalism, photography, art and media, research, and online reporting. 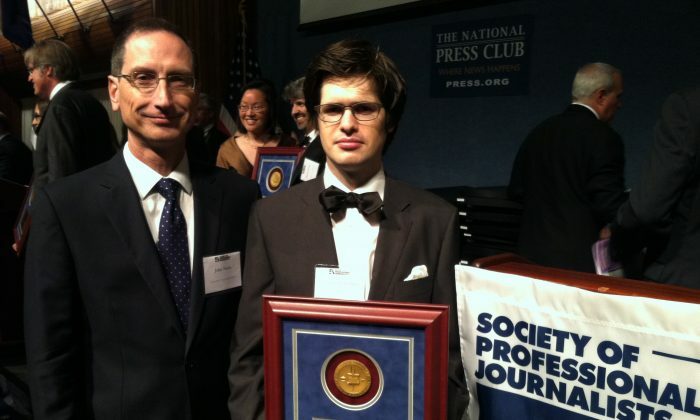 Epoch Times staffer Matthew Robertson was honored for his reporting on the atrocity of forced, live organ harvesting in China. The series of reports by Robertson include “Would Be China Defector, Once Bo Xilai’s Right Hand, Oversaw Organ Harvesting,” about a high-ranking Chinese security official’s forced organ techniques; “After Bo Xilai’s Purge, Searches For ‘Organ Harvest’ Suddenly Allowed,” which analyzes Internet traffic to examine the struggle within the Chinese leadership over accountability for these crimes; “Accused Chinese Organ Harvester Lurks in Transplant Community,” about a Chinese doctor who was head of the organ transplantation unit at a hospital implicated in organ harvesting; and “Friendly Ties Come With Award, But Ethicists Object,” on how a major university may have sacrificed ethics for the chance to develop closer ties with China. In choosing Robertson for the award under the category of Continuous Coverage, judges had high praise for the series. Other media outlets chosen for awards in the same category included The Washington Post, The Associated Press, The Boston Globe Magazine, Mother Jones, Center for Public Integrity, Texas Tribune, and others. “Robertson’s reporting revealed pertinent, new information about these crimes in China, while holding institutions in the west accountable for their witting, or unwitting, complicity,” said the presenters in giving Robertson his award. Organ Harvesting: Has the Tide Turned? While it may be hard to believe, the persecution and forced organ harvesting of Falun Gong practitioners has lasted twice as long as the Second World War. Zombie Film “World War Z” is adapted from a novel that includes organ harvesting in China as a major plot point, something the film will not include.